In December 2017, ESPN Sports Business Reporter Darren Rovell tweeted, "It's insane the amount of athletes talking crypto currency in the last two weeks." The insanity has not stopped. Whether it be in locker rooms or publicly, athletes continue to discuss the opportunities and pitfalls involved with investing in cryptocurrencies with some even putting their money where their mouths are. One such athlete is 4-time Pro Bowler and Super Bowl XLVIII champion Richard Sherman. When he's not shutting down wide receivers, Sherman is often thinking about how he can make money off the field. He is also now the spokesperson for COBINHOOD, a cryptocurrency service that provides a wallet to store Bitcoin, Ethereum and over 40 alternative coins. I recently spoke with Sherman about his investment strategy, why he is particularly interested in cryptocurrencies and what opportunities he sees in the space. How long ago did you first start investing and what did you begin investing in? Sherman: Municipal bonds were probably my first investment. I'm a low risk taker when it comes to my money. I didn't have the biggest contract my rookie year [a 4-year deal worth $2.22 million]. I also had a few mutual funds. Now, I have a couple Wingstops that I franchise and number of real estate investments. I also have equity in a number of companies and am invested in Berkshire Hathaway's fund. What brought your attention to cryptocurrencies and is there a particular cryptocurrency that interests you most? Sherman: Bitcoin was the first thing I invested in, and it was 2 years ago. The first time I heard about it was 6 years ago, when we started accepting digital currency on my website at the advice of one of the managers of the website. The fans wanted to use it and pay with Bitcoin. In hindsight, we probably should've held on to it. I personally like Ethereum. Obviously Bitcoin's the flashiest and most expensive, but I see people branching more off the Ethereum blockchain than any others. How much of your overall portfolio would you say is invested in cryptocurrencies and do you see yourself either pulling back or adding more to your position? Sherman: Probably like 5%, if that, is invested in crypto. I probably have less than that in stocks, but more in bonds. What do you think will be the next big news event in the world of cryptocurrency? Sherman: I think bigger companies that have IPO's and have been in that world forever will start to move to crypto coins. I think more people will start to use cryptocurrency to pay for common items like groceries and clothes. Some of the things you run into are trading fees just like when you trade stocks. That's what makes COBINHOOD a great platform, because it eliminates those fees and allows you to make more profits than other platforms would. Offering your restaurant customers the newest and fastest ways to pay or book a table is a great perk. In fact, there are lots of emerging restaurant tech options for owners to offer their customers and help run their business more smoothly. But one factor trumps all those — food quality. According to this new infographic from Toast, makers of restaurant plefi, 60 percent of survey respondents say that food quality is the most important part of their visit to a restaurant. All the bells and whistles in the world clearly can’t top a great steak cut or some really fresh vegetables. Although most people say food quality is very important to a great restaurant experience, other factors clearly also make it more likely your customers leave your establishment happy and ready to book their next visit. Tablets at tables, for one, are important to improving a dining experience at a restaurant. The Toast data shows 61 percent of restaurant customers believe a handheld tableside tablet helps improve their overall experience. Customers can use these tablets to stay in contact with your wait staff, allowing them to order drinks or another appetizer or dessert without further distracting your servers. And tablets help you, the restaurant owner, too. In fact, 67 percent of restaurant owners say these tablets also help improve their business operations. Outside of tablets at the tables, 73 percent of diners told Toast restaurant technology overall helps improve their visit to a restaurant. And 95 percent of restaurateurs say this same technology helps improve their business operations. The Toast data shows this tech doesn’t need to be anything special. Just the ability to split a check among guests is a big plus. For example, According to the numbers from Toast, 90 percent of diners will pay for a full meal if they can use a credit card. Expect more of an a la carte situation — and lower check totals — if your guests are paying cash. 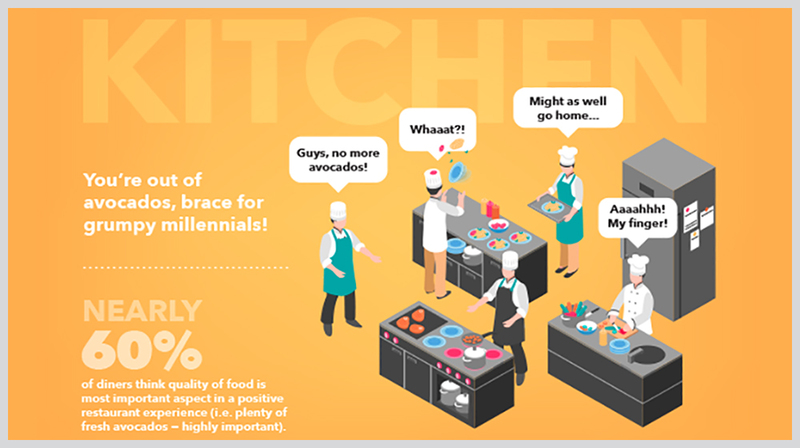 For more information on tech in the restaurant industry, check out the full Toast infographic below. Like a lot of the indie studios that have cropped up over the last few years, Spearhead Games’ founders, Atul Mehra and Malik Boukhira, were originally AAA developers. The pair met when they were working at EA in Montreal on a project that wasn’t looking very healthy. But Spearhead Games would take another four months before it was established and able to actually start working on projects. The problem? They had no money. Enter the Canadian Media Fund, a government and media-funded organization that finances and assists in the development of Canadian televisions and digital media projects. Competition is intense and to ensure their application for funding had its best shot, they called on friends in the form of one of Red Barrel Studio’s founders, Philippe Morin (Outlast), and Minority Media (Time Machine VR). It’s indicative of the community in the city, the pair agree. It’s grown from around 20 studios in 2010 to over 160 now, and Boukhira and Mehra describe it as very close-knit, with studios happily helping each other out. One of the reasons they wanted to leave AAA behind—aside from the grim future for the game they were working on and the studio itself, which was closed shortly after they left—was the transformation of the industry. They remember, a decade ago, AAA being more like today’s indies, but as projects became larger and team sizes blew up, it changed into something very different; a place where experimentation and risk were shied away from. And it’s Spearhead’s agility that allowed the studio to finish their last game, Stories: The Path of Destinies, an action-RPG, in a blisteringly-fast 11 months. It has not, however, always paid off. ACE – Arena: Cyber Evolution was Spearhead’s MOBA bid. They put their own spin on it, by creating a futuristic sport. They dubbed it a MOSA (Multiplayer Online Sports Arena). Now they think it came out too early, with even Epic approaching them to say they would have seen a lot more success if they released it now. Now Microsoft’s streaming platform, Mixer, is trying just that. It means they’re able to pivot to a new genre quickly because the way players interact with the world is what connects their games, not the genre. They’re learning, however, that this does create a problem when it comes to explaining what their games actually are. For Stories, the task was simpler. It was an action-RPG, something familiar and easy to describe. The narrative and the game’s consequence-heavy, time-hopping structure allowed Spearhead to still experiment, but all it took was a glance at a screenshot to understand that it’s ultimately an action-RPG. The studio’s next game, Omensight, shows how they’ve learned to balance their ambitions with familiarity. Though it’s not a direct sequel to Stories, notes Mehra, it’s a spiritual successor set in the same universe, and thus a game that fans will recognize. Mechanically, however, it’s very different, and while time-travel and action-RPG combat returns, Omensight is very much its own thing: an action adventure game that’s also a murder mystery. Boukhira describes it as being a bit like walking in Columbo’s shoes. Just as the cigar-smoking, raincoat-wearing detective sticks to suspects all day, constantly following them around and annoying them, the Harbinger pesters them too. But through multiple timelines. This is complicated by the fact that a war is raging, with two factions dedicated to the other’s destruction. The Harbinger can interact with both, even teaming up with one or the other in different timelines. It means you can see the war from different perspectives, as well as experimenting with how the outcome of the war affects the murder mystery. Within these factions are key characters–generals, warriors, sorcerers–who serve as both suspects and companions. They all come with their own behaviors and personalities in and out of battle, and the power of the Harbinger is to influence these behaviors in an effort to change the result of the day. That could mean stabbing a general to get in someone’s good graces, but it could also mean joining the same general in a battle and helping them out. Companions shake things up too. They might run off and use their own tactics to take out an enemy, or they might actually be friends with the group you’re about to fight, letting you sidestep the bout entirely. At least in that timeline. Approach them with a different companion and you might need to get your sword bloody. Ultimately, combat is just another tool that you can use to change the world and solve the murder mystery at the heart of it. The one thing you can’t do is talk. The Harbinger is a mute protagonist. It’s an old trope that has a mechanical purpose this time. Spearhead wants players to make gameplay decisions exclusively through taking action. This doesn’t mean that there’s no way to communicate, however. Actions speak louder than words. Kill someone’s enemy and you’ll make your intentions clear. And then there’s the titular omensight, arguably the Harbinger’s handiest ability. Whatever you do, it’s always reversible. It’s the team’s favorite part of the time loop system–the fact that you can always go back and change things. Every action has consequences, potentially dramatically changing the world and at least putting you one step closer to solving the mystery, but you’re not stuck with those consequences. Once you’ve learned how things play out because of your actions, it’s just a matter of starting the day over with that foreknowledge. A release date has yet to be set, but Mehra teases that the studio is going to be picking one in the next month, and it will be in 2018. It’s coming out on PC, but Spearhead is also in talks to have it appear on other platforms.